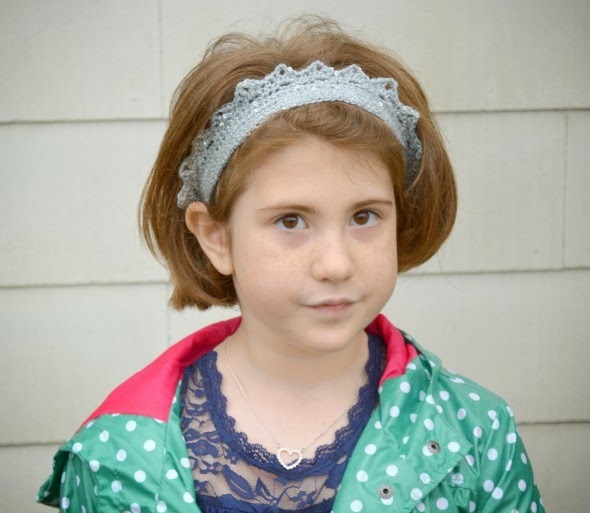 I made a birthday crown headband for Mims's seventh birthday. It was adorable, and totally appropriate to wear to school, as opposed to the giant birthday tiara that I wanted to get her. Teachers tend to frown on that type of distraction in class. LOL! I used my recent headband discovery (you know, the one where I found a way to keep them from stretching out until they were too big to actually hold hair back) to add some structure to the crocheted part, which had the added bonus of making it even more sparkly, and your crochet expert friends will never be able to figure out how you made it. The other thing that I think is super cool is that it only takes about 25 yards of yarn to make them, so for the price of one skein of yarn you could whip up a batch of headbands for all of the girls coming to the birthday sleepover. Very cheap, very cool party favors!!! 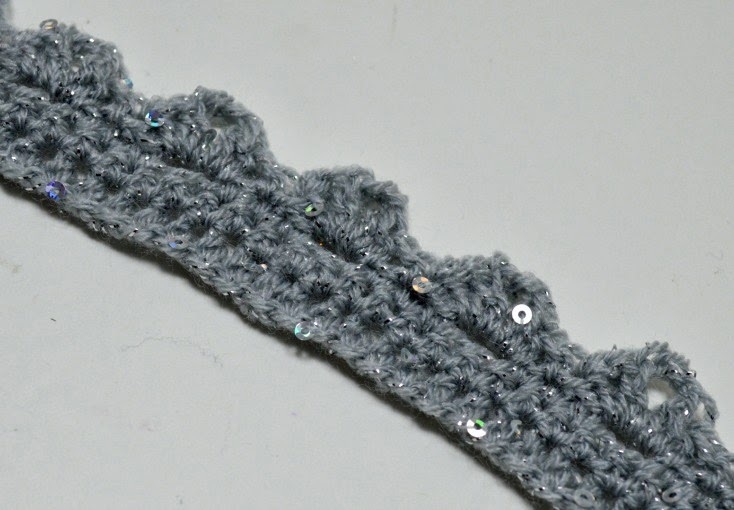 1/8" elastic - approximately 13"
Attach yarn at end, and make a row of 70 slip stitches in between the stitches of R1. Fasten off. Make another row of 70 slip stitches in the holes created between R1 and R2. Fasten off. Make a third row of 70 slip stitches in the holes created between R2 and R3. Fasten off. Weave in all the ends. 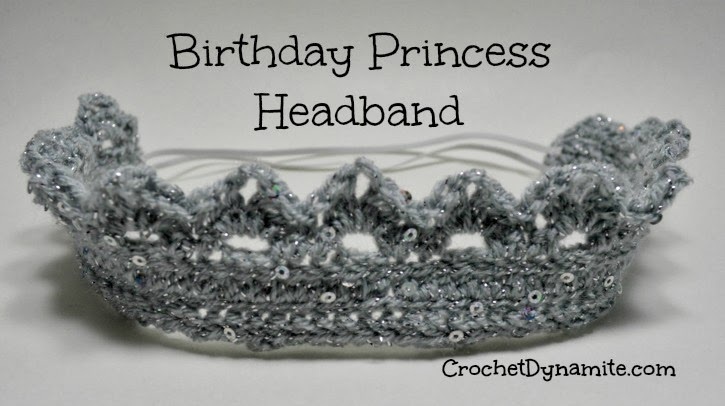 The finished crocheted crown piece should measure approximately 13 1/2". Cut the elastic in half to make two 6 1/2" pieces. Pin the two pieces to the ends of the crown, one at R1, and the other at R3. Try that sucker on! Everyone is beautiful in a crown! Because of the elastic in it, this headband fits my daughter perfectly, and it also fits me comfortably. I have several adult friends that will LOVE being birthday QUEENS this year! 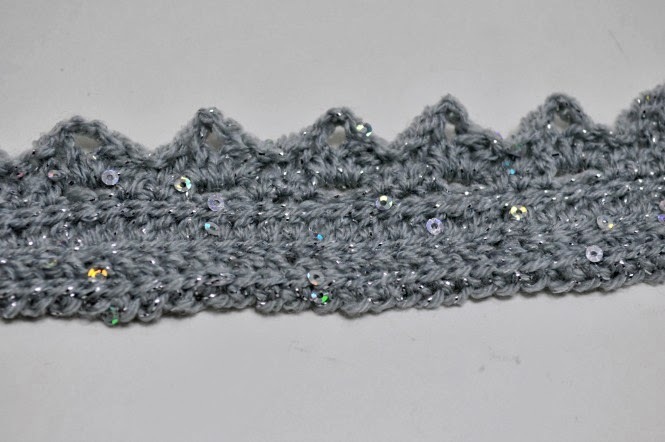 Even if you're not a headband-type, who doesn't love a sparkly crown?! Me too!!! I have to admit, a few extra and I plan to one for myself. There are just some days that having a crown makes everything a little easier! Hmm. I don't know why it chopped up my sentences... that's what I get for not checking it before I hit enter. LOL!